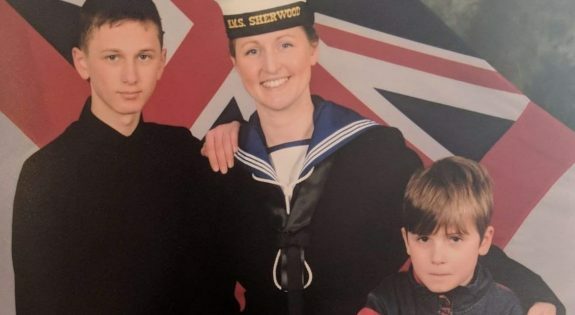 A mother-of-two from Derbyshire is encouraging other mums not to give up on their dreams after she followed her own to join the Royal Naval Reserve. Able Rate Michelle Rowlands, aged 37, joined HMS Sherwood in Nottingham two years ago where she successfully completed her training and has now become the Recruitment Officer for the East Midlands. Michelle said: “I wanted to be challenged and be pushed out of my comfort zone and to do things I would never get the opportunity to do in my civilian life. Michelle said her role as Recruitment Officer has boosted her confidence. “It’s the first time I’ve been put in a leadership role and it’s taught me how to work well with people and my confidence has continued to soar,” she said. “You might think that you can’t join because you’re a mother but I am proof becoming a parent doesn’t have to stop you from achieving your dreams. When I go away my children are really encouraging and can’t wait to hear all about what I have been up to. Michelle’s children are aged 15 and 11 with the youngest receiving extra support with homework when Michelle is away. Michelle said: “His school receives extra funding because he is classed as a military child even though I’m not in the Regular Navy. This means the teachers can be there to help support him when I can’t. “I would recommend anyone who wants a new challenge to join the Royal Naval Reserve. Just because you’re a mum doesn’t mean you can’t offer something valuable to the Armed Forces. "Just because you’re a mum doesn’t mean you can’t offer something valuable to the Armed Forces."